Newly weds Cheri and Matt had a traditional Irish wedding in North West suburbs of Chicago. They first had their engagement photos in Cheri’s backyard in Crystal Lake. The couple was already familiar with our photography style and happily welcomed us back in their Crystal Lake home before their wedding ceremony begun. The photography session started with Cheri getting ready at her home . Cheri had on a gorgeous silver dress with silver floral designs sown in and sparkling diamond earrings to match it all. Cheri was excited and nervous at the same time for her big day. She was extremely happy to have her wedding at Chalet Hill Golf Course and couldn’t wait to see her soul mate. Cheri and a couple of close friends arrived with her at the outdoor ceremony. Matt escorted by Niamh come to the aisle. The ceremony ended with the Declaration of Marriage then First Kiss and introduction as Mr. and Mrs. It was a small wedding at Chalet Hill Golf course with only a few close friends and relatives but most of them arrived from overseas, some from Ireland some from Australia. All the men who attended wore kilts to celebrate the special moment with Cheri and Matt. Once the ceremony was done and family portraits taken we went with the couple for a lovely outdoor photo session on the golf course and even took some with their friends and family. 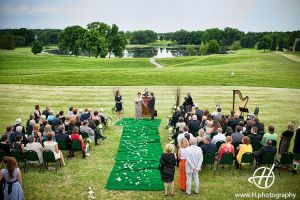 The weather was beautiful for this outdoor Irish wedding in Carry IL. After the wedding ceremony, the guest headed for cocktail hour at the Challet Hill venue, while the couple and a few friends continued with their wedding photography session. The reception started at the clubhouse and there was a short introduction of both the bride and groom from the best man and maid of honor. There were a lot of cheers and laughter for the couple and special speeches were prepared for the occasion. When the toasts were finished, the couple cut their cake and celebrated their first dance together. It was definitely a memorable wedding in Cary Illinois. This entry was posted in wedding venues, weddings and tagged Cary IL, ceremony on golf course, Chalet Hill Golf Course, getting ready in Crystal Lake, Irish Wedding, kilts at wedding, Matt and Chery. That wedding gown is INCREDIBLE! What a lovely lady and a lovely wedding!!! Beautiful! What a beautiful concept of an Irish wedding in Carey, IL. I love that harp! The harp was a great addition to the Irish wedding.